At its best, an identity system communicates who you are and what you stand for without any exposition. It translates your mission, your vision, and your purpose into a visual language that elicits an emotional response. That’s quite a tall order for what is essentially a collection of shapes and colors. 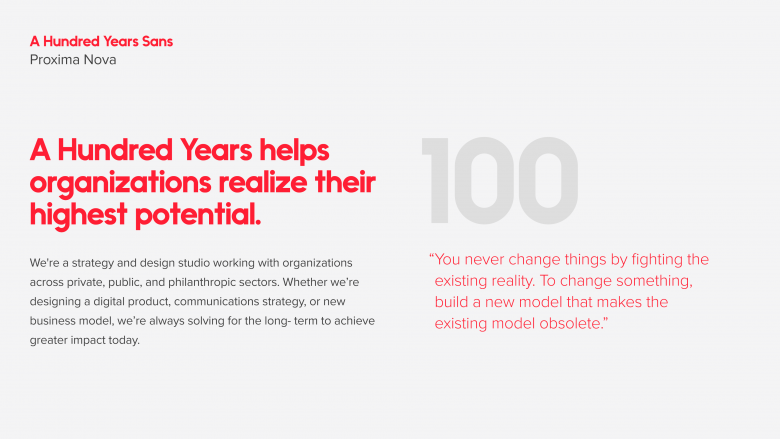 Since I joined A Hundred Years in 2014, I’ve been part of a design team that has had the opportunity to evolve identity systems for leading philanthropic, government, and corporate organizations. But through all of that, there was one identity that we never got around to working on: our own. The core elements of our identity system were determined before my time, and over the years, we’ve simplified it significantly. 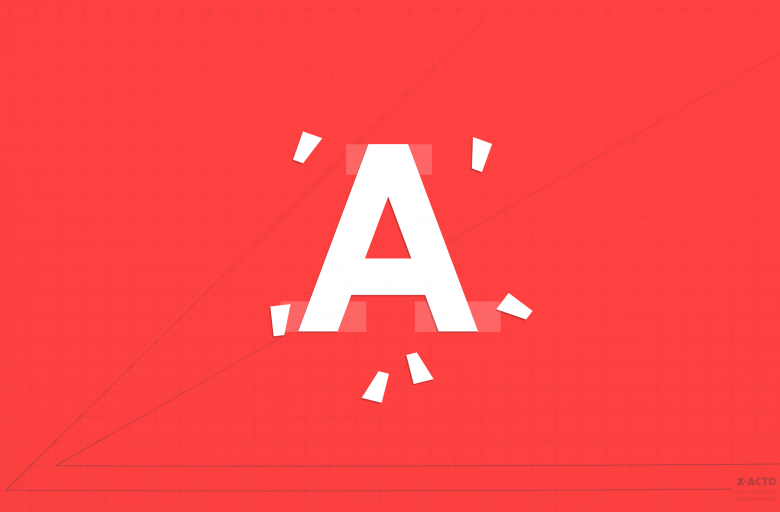 About a year ago, we decided it was time for a refresh with a focus on typography. 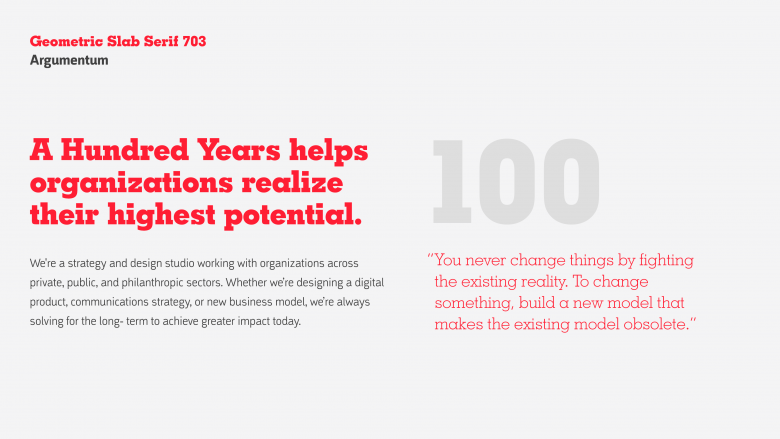 Our old identity used Geometric Slabserif 703 for headlines and high-level copy. It’s essentially the Bitstream rendering of Rudolph Wolf and Chauncey H. Griffith’s Memphis typeface, created circa 1930. It’s nice enough, and I’m certainly a lover of vintage designed objects, but to me Memphis, Geometric, and slabbed brethren Rockwell have always felt a bit more at home on Burger King wrappers and eye charts than for a future-obsessed, purpose-driven organization. There are many more contemporary slab serifs that would help to freshen up the look, but after much deliberation, we determined that slab serifs in general were the wrong approach for our purposes. Most slab serifs impress the importance of the content and that’s a good thing. However, they come across as being slightly stubborn. Geometric-based slab serifs that became popular in the 1920s and ’30s were largely based on the geometric sans serifs of the time and essentially just add ornamentation to what is already a clear and legible experience. Visually, slabs are concrete. They’re immovable. They communicate conclusion, not curiosity. Furthermore, our secondary type system was not really carrying the weight we needed. At the time, we were using Argumentum for supporting duty. The implications of naming not withstanding, Argumentum is a slightly condensed face designed in 2012 that had little-to-no formal similarities to Geometric Slab 703. Again, it’s a fine face in its own right, but the two together span the historical (if not the personality) range of Herbert Hoover to Barack Obama. That might make for an interesting podcast topic, but it does not lend itself to a strong and cohesive identity system. Clearly we needed another approach. If our problem with our display face lied in its slabs, why not just remove them? What we were left with was the entire category of Geometric Sans Serifs that would span the gamut from archetypal fonts like Futura and Avenir to the contemporary revivals such as ever-present Circular , the even-more-ever-present Gotham, and the lovable oddball Raisonné. Within this ecosystem is a bewildering array. The idea of returning to a century-old typographic foundation is appealing to me for obvious reasons, but recent trends in typography have also pointed to a new and different understanding of geometric sans serifs. Traditionally seen as being cold and clinical, contemporary adaptations and usages have seen an unprecedented humanization of the genre. Take, for example, AirBNB, Google, and Spotify’s use of humanized geometrics. 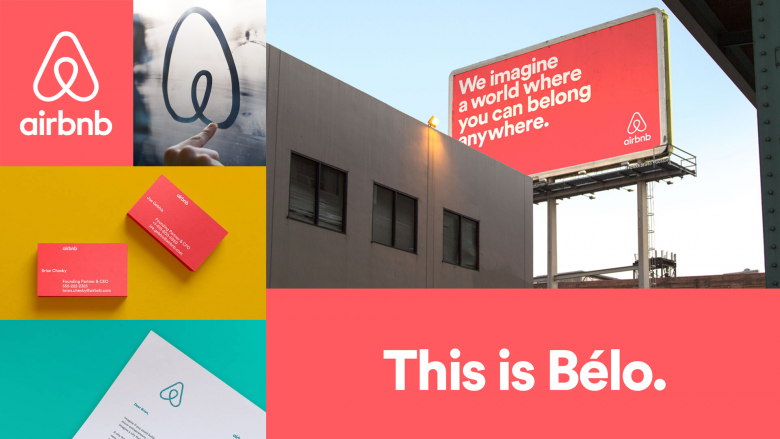 AirBNB’s rebrand included their unique “Bélo” mark, and Circular Standard as a humanizing Geometric Sans. Google’s rebrand focused on geometry as a core element of the identity, and proliferated the core products with a custom “Product Sans” typeface. Spotify uses duotones images and creative applications to augment their choice in Circular. There’s no shortage of typefaces claiming the space of the “friendly Futura.” Whether or not this is just the stylistic preference of the day or a true evolution in the perception of geometrics, it leaves us in a conceptual space of continually chasing an evolving flavor. To use this space in a way that felt unique or at least interesting to A Hundred Years, we needed to do something a little different. We started feeling like perhaps we should just make our own typeface. Full disclosure: I am not a type designer. I recognize that there is a level of knowledge and understanding that comes with making a usable and correctly proportioned typeface. There are rules to this game, and don’t even get me started about the intricacies of kerning pairs and metrics. But, I’m also not a trained chef, a mechanic, a carpenter, or necessarily even a writer. These things have never stopped me before. So with the blind confidence of a child who just took the training wheels off of their bike for the first time, we began to design A Hundred Years Sans. The first thing we did was to simply create a collection of basic geometric rules that would guide the project. One circle was the standard cap height, the next size was based on our x-height, the next on approximately 50% of cap height, and the smallest circle at 1/3 of cap height. 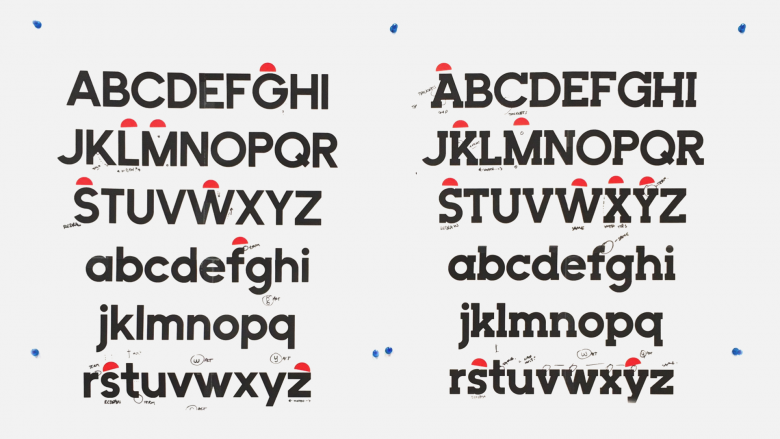 These basic shapes would help to determine the general proportions of letterforms. The extremely large x-height of the typeface (approximately 70% of our cap height) was chosen to aid in legibility and visual importance. From there it was really just a simple exercise in trial and error. We would create some letterforms, test them out in various scenarios, and adapt accordingly. At a few points, we convened the design team to offer stylistic feedback and to address any functional issues that had come up. After we were happy enough with our results, we started applying it to select instances to learn more about how the typeface worked in various contexts. Eventually we had something that was close enough to a working typeface to let it out into the wild and start using it on A Hundred Years materials studio-wide. Group critique would focus on individual letterforms and the overall feel. At one point we were designing a slab version in parallel, but it was ultimately scrapped due to the desire to fully move away from slab serifs. Critiques were typically held over lunch and offered a chance for our designers to provide input into the development. The version currently in use is really a beta. It has the core characters and most of the typical punctuation marks. We’ll continue to gather feedback and most likely re-release an updated version in the next year or so. It’s far from finished, and has a lot of weird quirks to it, but much like all of us, it’s the quirks that makes us truly unique. In the meantime, we’ve been strictly using it where it can shine as an aesthetic punctuation without the added responsibility of needing a wide range of weights. Limiting A Hundred Years Sans to display means we needed a secondary typeface that was designed by someone who actually knew what they were doing. What we needed was a workhorse. Something that can play nicely with our new direction and carry anything we could throw at it. It needed good numerals, complete character sets, and the ability to speak in a range of voices. Something that was contemporary but still had a bit of a reference to our geometric core. Enter Proxima Nova, designed by Mark Simonson. Its availability on nearly every type platform means we can use it for print, presentations, web, shared Google docs, and more. Together, A Hundred Years Sans and Proxima Nova form the foundation of an evolving A Hundred Years identity. The truth of the matter is that type design is a very difficult, tedious, time-consuming experience done by highly trained experts. You should respect type designers and financially support the products that they make. What we’ve created in A Hundred Years Sans is a highly aesthetic endeavor. We focused on creating a typeface that would be unique to us and that would more closely align the look and feel of the organization to what we believe in. It works well enough for us to rely on it for grand statements and titles, but with its single weight and limited character set, it can hardly be put on the same level as the considered and well-rendered typefaces that we’re used to using. However, at A Hundred Years, we’re always asking what’s possible. It’s this spirit of optimism and possibility that guides us in our everyday work to reach beyond what we know we can do and challenge ourselves and our clients to achieve something greater. It would have been much easier for us to simply apply Circular or Gotham and call it a day, but we used a slight brand refresh to challenge and invigorate our design team into creating something unique. In a way, A Hundred Years Sans is an expression of us. A slightly quirky, oddly-shaped, and evolving vision. Or maybe it’s just a typeface.